Hello! 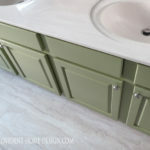 I excited to share my friend Lolly’s powder bathroom makeover today. We started working on it a few weeks ago with the attempts to make it a bit more up-to-date and stylish. Big change, right? So what did we do? 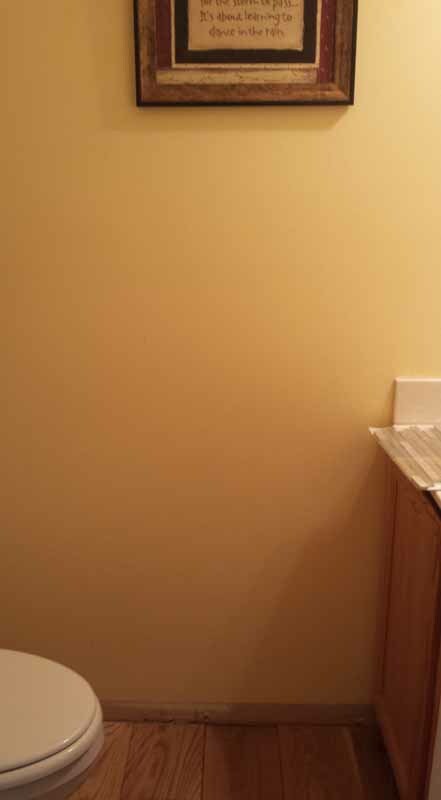 First thing Lolly did was paint her bathroom walls Valspar Decadent. I would describe Valspar Decadent as a cream with gray undertones. 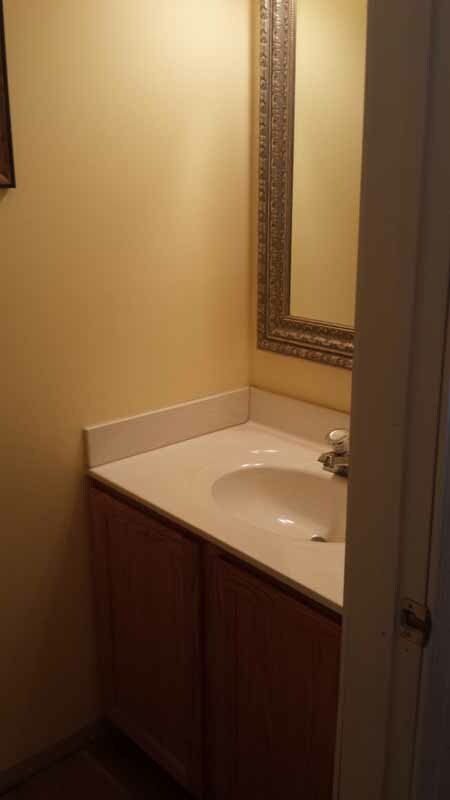 We knew painting the walls a lighter color would be important in helping the tight space feel more spacious. 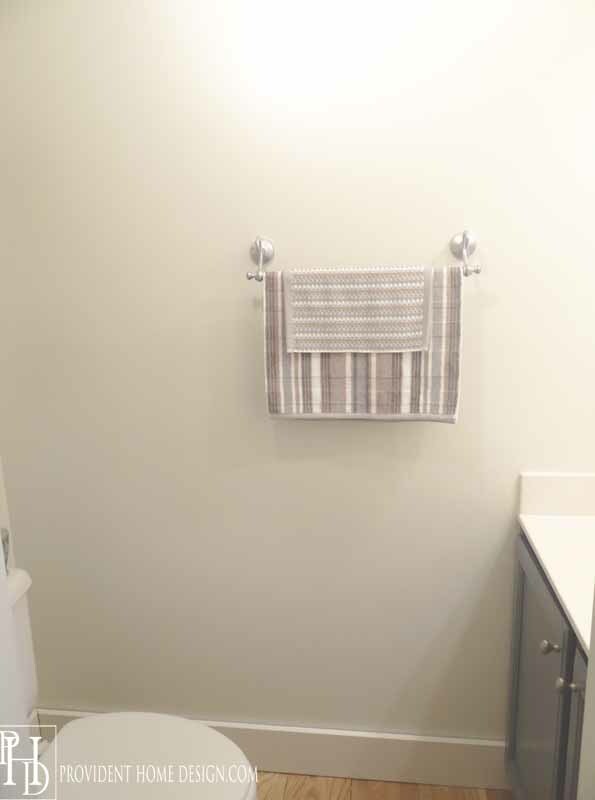 Next Lolly moved her towel bar from the back wall to the side wall as it made more sense to have it closer to the sink. But before re-installing we gave it a new chrome metallic sheen with the same spray paint used on the DIY mirror. 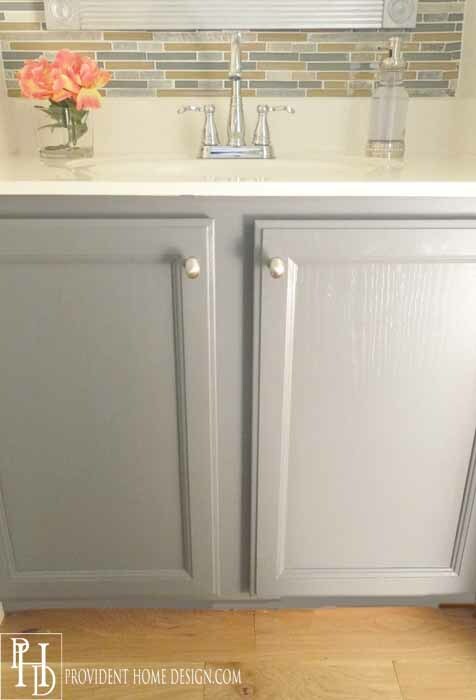 Then Lolly painted her cabinets Behr Liquid Mercury which definitely falls under the slate blue/gray family (tutorial for painting bathroom vanities HERE). 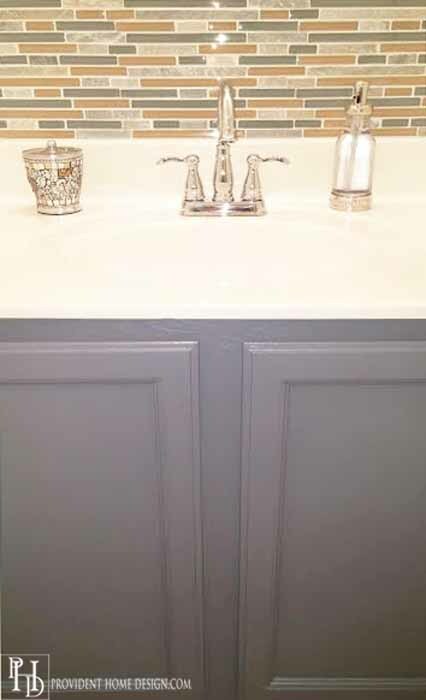 I’ve been crushing on this color for bathroom vanities ever since I saw it in a Restoration Hardware catalog. This wasn’t the photo but it is the color I love. 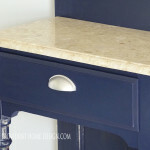 After the cabinets were dry she added lovely oval shaped knobs to the cabinet doors by drilling holes in the cabinet doors and then screwing the knobs in (this is a very simple and inexpensive way to add some personality to your bathroom vanity). The knobs were only $2.59 a piece. 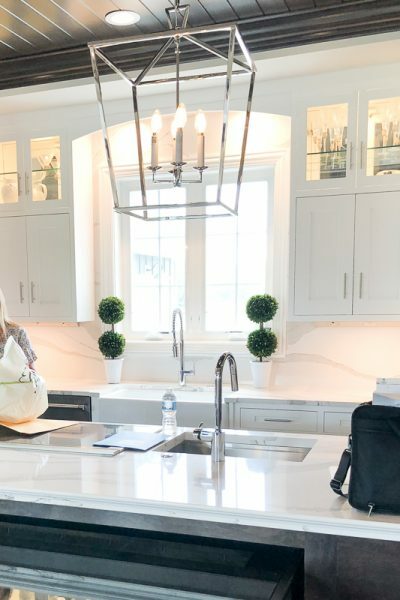 Lolly’s powder bathroom had the basic builder faux crystal faucet fixture and I just knew once it was replaced with something less basic that it would make a world of difference and it did! 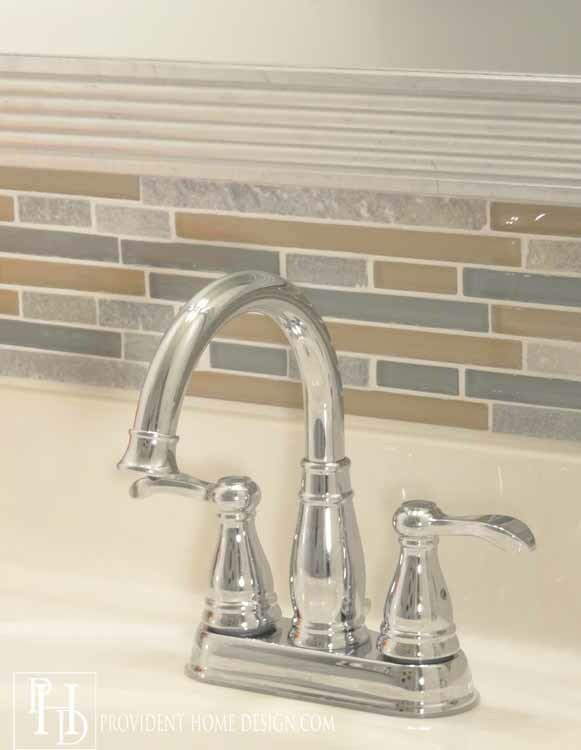 I suggested she look for a gooseneck shaped faucet and she came back with this beautiful Delta faucet for only $68. And thanks to her hubby, Doug, for installing it! 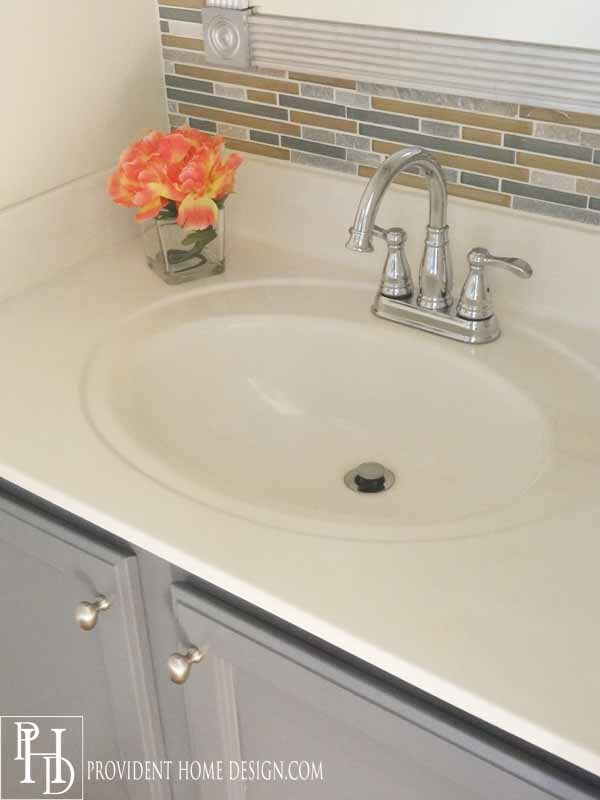 Next she added a glass and stone mosaic tile backsplash all the way from the sink to the ceiling. This was a backsplash I found on clearance for $1.84 a sqft. at Home Depot a couple of months ago. She did a great job and please believe when I say you could do this too! 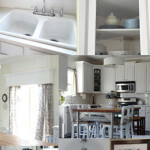 Here is my step by step backsplash tutorial if you are interested. 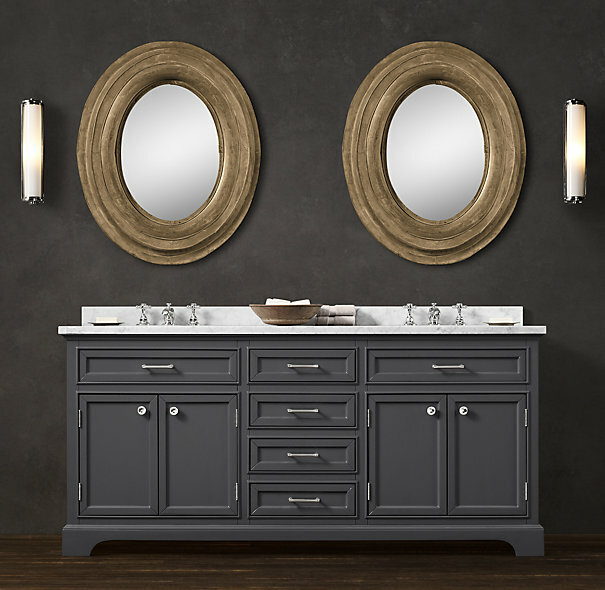 The DIY mirror is a Restoration Hardware knockoff. Their version is on sale for $739. Our version only cost $35 to make. Tutorial to come! We purchased the vase and flowers from the Dollar tree for a whopping $2. I love how the orange flowers pop against the slate blue cabinets! 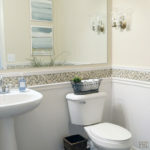 Here are some sources from the bathroom makeover if you are interested. The tile is the closest I could find to what we used and of course the mirror tutorial will be coming soon. Update: Here is the link to the Restoration Hardware Knockoff Mirror. 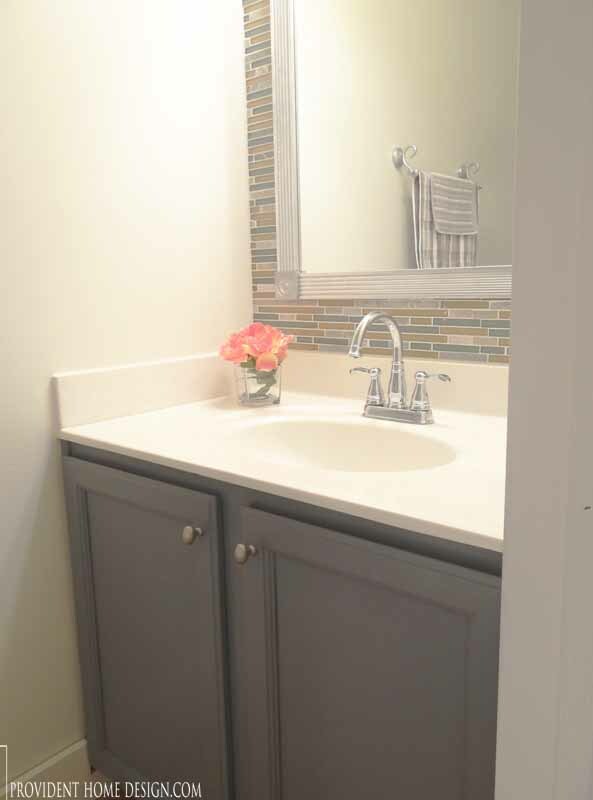 This bathroom went from boring builder basic to high-end fantastic, thanks to you Tamara, and I love it! And the transformation was so affordable!! What project can we do next?? That would be a blast, Jen! Looks fabulous! Way to go ladies! 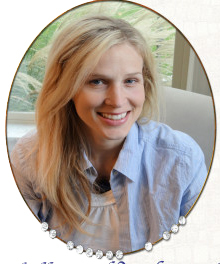 Would love to see what you’ve been up to in your new home, Wendy! What a transformation! It looks so bright and airy. 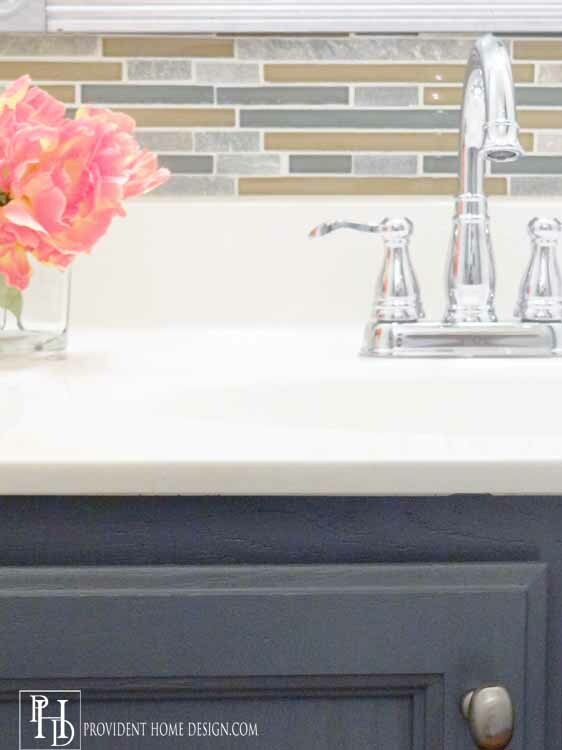 I love the mosaic backsplash the most! Can’t wait to see your tutorial! Beautiful color transformation! 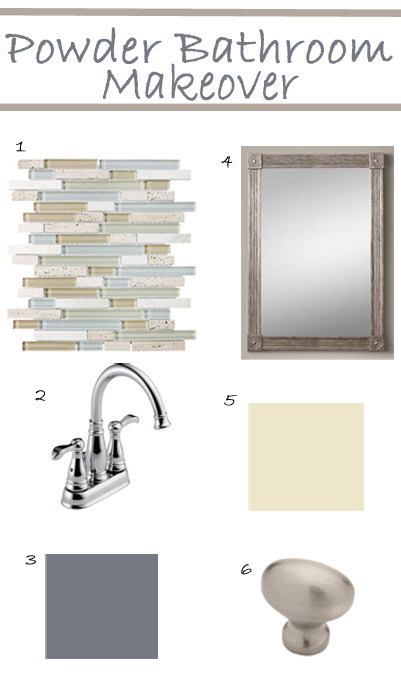 Love that backsplash and mirror; great idea! Love it Tamara! Nice meeting you tonight! I just may need to use this paint color somewhere!!! Bravo! 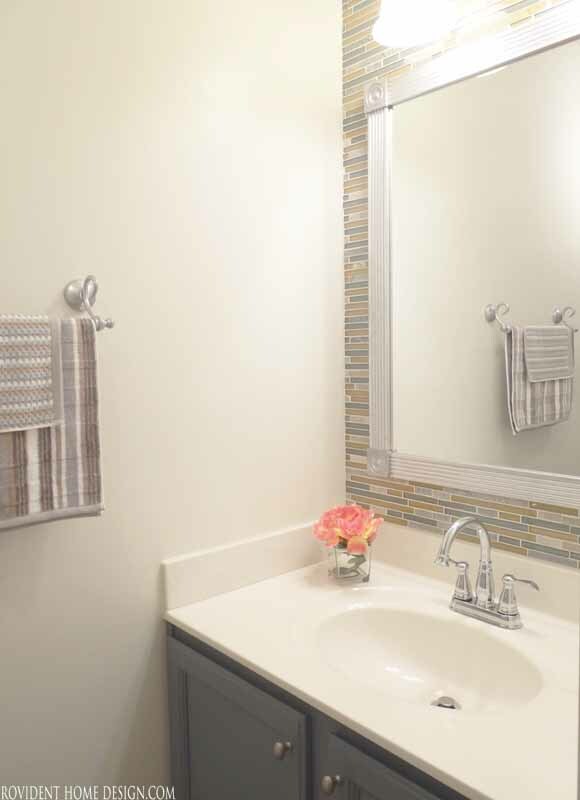 Love the grey with the glass tiles. Such a nice upgrade. The color combination works nicely with the chrome. 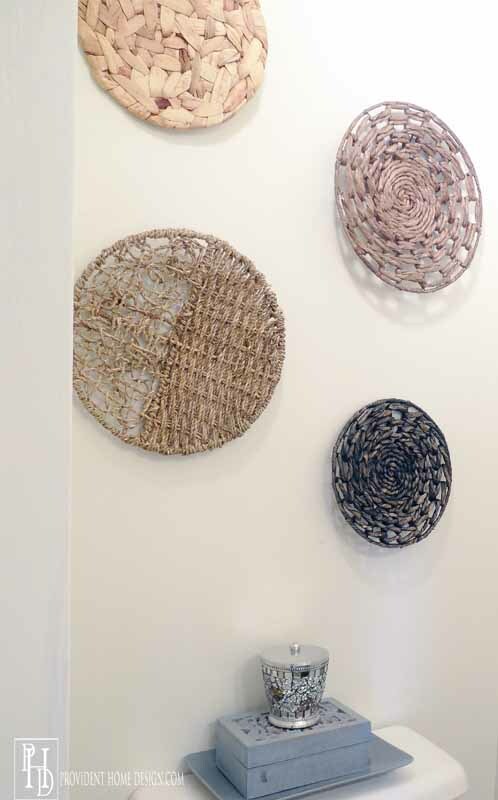 Wow Tamara, you completely transformed this little bathroom! 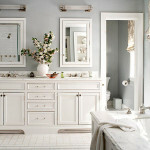 I love the vanity color and the soft color on the walls!! Thanks so much for sharing it at the Best of the Nest party! can’t wait to see how you did the mirror!! Love it all. 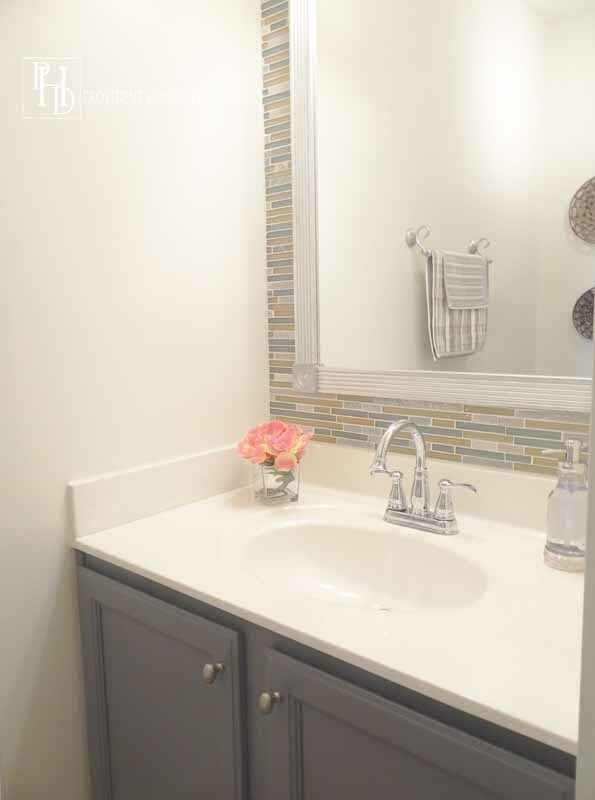 How is the mirror mounted over the tiles? I want to do the same thing. Hey there! 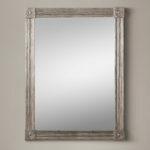 Here is the link to the post that describes how we attached the mirror “over the tiles”, http://providenthomedesign.com/2015/04/23/restoration-hardware-knockoff-mirror/. Let me know if you have any questions! 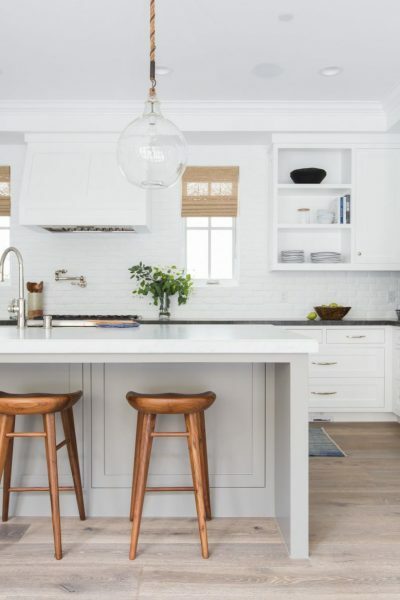 I see you also changed the baseboards to be taller and white? 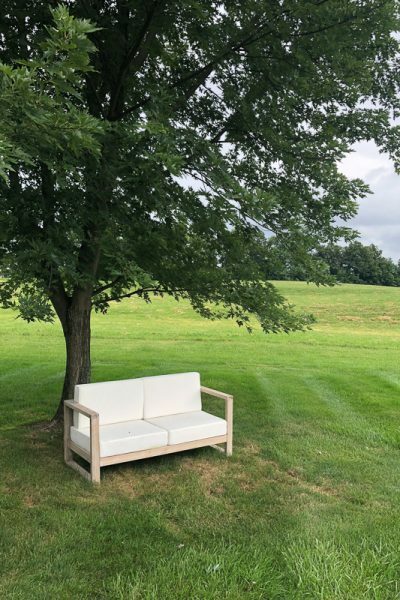 How much did the project cost you overall? I’m assuming the labor was no charge as you did it yourself? Yep, labor was no charge. I would guesstimate the total cost of the makeover including baseboards, paint, and everything was around $240. Thanks for your question, Gayle! This is so gorgeous! 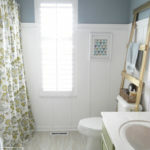 Thanks for the inspiration for my half bath! Hello. Just found this on Pinterest and am in love! 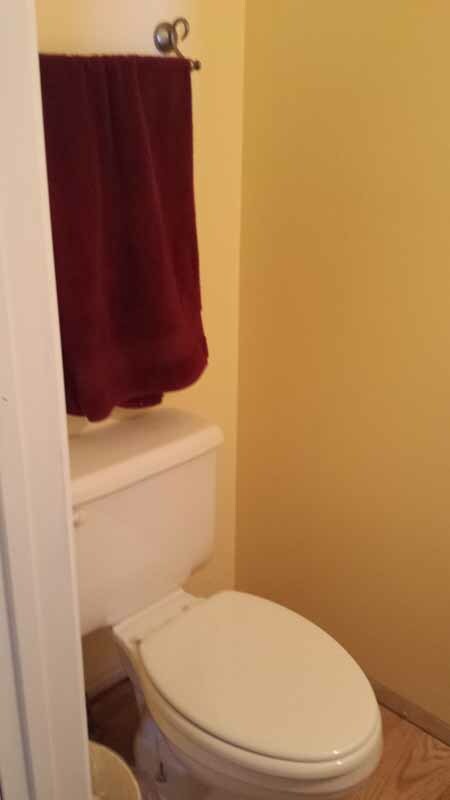 I have a small bathroom that is windowless and I’m trying to brighten it. 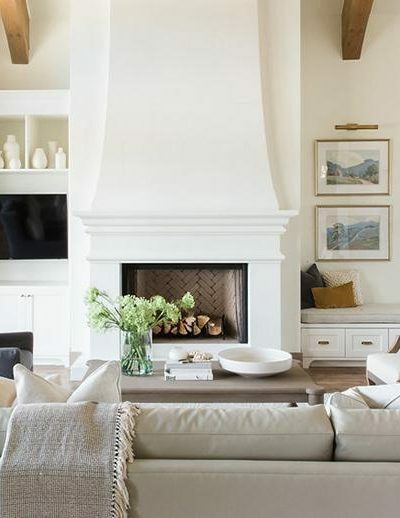 Did the paint color really brighten it that much, or did you also replace the light fixture? Thanks! Hi Lindsey! The light fixture is the same one, it was not replaced. 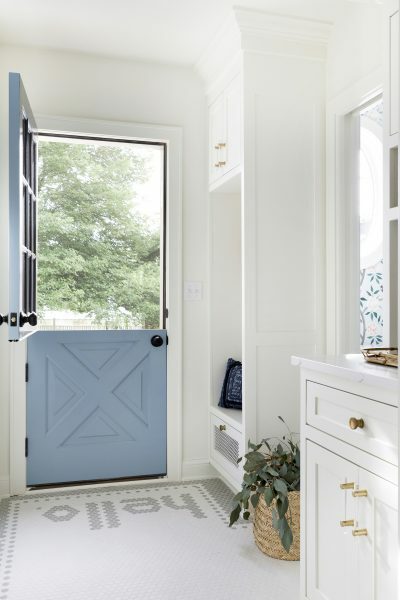 Paint colors changes really do have that much power to brighten a space! :-) There were way too many rich, warm colors going on before which was suffocating in such a small space. 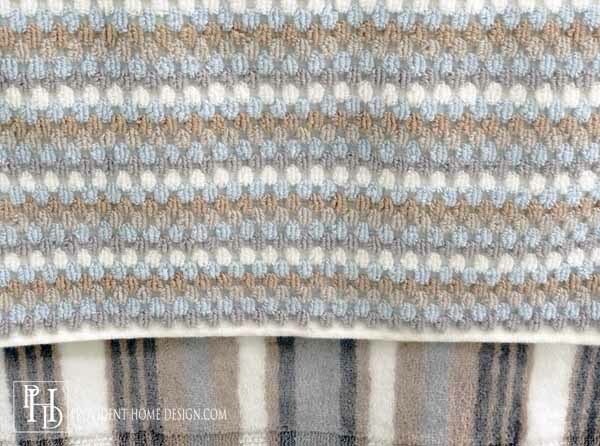 It really helped to bring in some cooler toned, more neutral colors to open the space up a bit. Thank you so much for responding! I have the same paint color as before going on, so I definitely plan to buy this color! Thanks so much for the inspiration! Did you change the lighting as well? 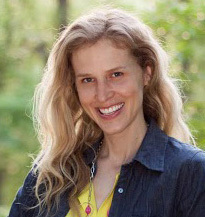 Hi, Jen! :-) Nope, it is the same exact lighting as before! 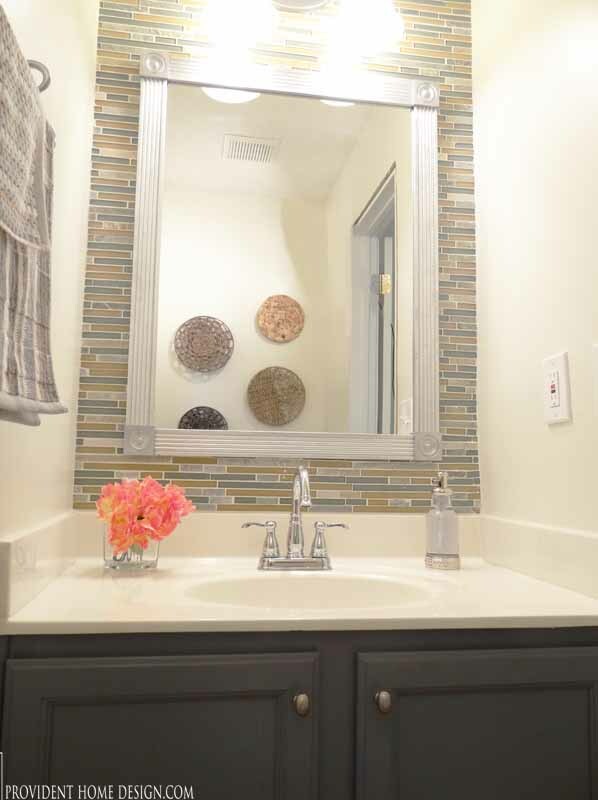 Did you tile the whole wall or just around the mirror? Hi Ashleigh! 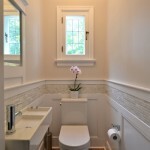 We tiled most of the wall but left about a 12″x 12″ space that we screwed a 12″x12″ piece of wood to. Then we mounted the mirror to the piece of wood. Does that make sense? Let me know if you have any other questions!! Beautiful! It surprises me you didn’t change the lighting. Do you know the size of the vanity?